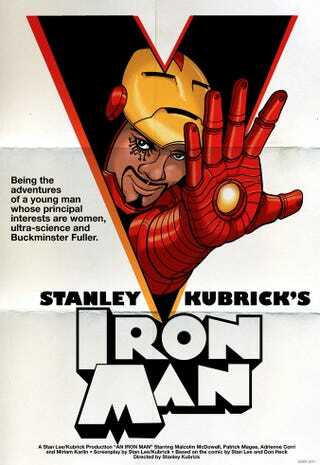 What if Stanley Kubrick directed Iron Man? Warren Ellis previously challenged artists to imagine a David Lynch-directed Spider-Man film. He's now asking members of his Whitechapel forum to depict Stanley Kubrick's interpretation of Tony Stark and his full metal jerkin. You can find many more samples over at Whitechapel. This is my power-suit, this is my armor. This is for fighting, this is for amour. For more never-was Kubrick blockbusters, check out posters for his Beatles-centric Lord of the Rings.